Looking for ways to make Mother’s Day special for a special someone? Consider whipping up some of these Mother’s Day brunch recipes that include flowers as ingredients. Then, serve them to your mom, wife, or other special mom in your life. 1 prepared pizza crust (available at Whole Foods Market or other health food stores, or make your own using this recipe from Oh She Glows). Place oven baking rack in the middle position. Preheat oven to 425 degrees. In a large skillet, heat olive oil over medium until it sizzles when a small bit of water is dropped in it. Add all pizza ingredients. Cook until veggies are soft and slightly blackened (about 10 to 15 minutes). Set aside. Prepare sauce by mixing tomato sauce and seasonings in a medium-sized bowl. Set aside. Set prepared pizza dough, or roll out dough thin, on a lightly floured pizza stone or baking sheet. Add sauce in a moderate amount, leaving about an inch of dough uncovered at the edges. Add sautéed veggies. Place pizza in the oven and bake for 18 to 20 minutes, or until the crust is crisp and golden (on the edges, and peer underneath). Serve pizza with vegan parmesan and red pepper flakes on top, if desired. 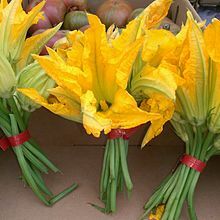 And, of course we think you need to add the squash blossoms. The following margarita recipe comes courtesy of MinimalistBaker.com. To make the hibiscus tea concentrate, bring 3 cups water to a boil, add hibiscus tea, stir, remove from heat and let steep for 30 minutes. Strain into a jar or glass container using a fine mesh strainer and add sweetener to taste. I found 1/3 cup was about the right amount, using 1/2 agave nectar, 1/2 cane sugar. Stir to dissolve and let cool. To make two margaritas, add ice, cooled hibiscus tea concentrate, lime juice, tequila and 1 tablespoon agave nectar (optional) to a cocktail shaker and shake vigorously to combine. Pour over two glasses with ice. We love this oversized ice cube mold for cocktails. Salt or sugar rim is optional. Garnish with lime wedge. If too strong, dilute with a splash of sparkling water. Store hibiscus concentrate covered in the fridge for up to 2 weeks, though best when fresh. * Notes – Hibiscus tea concentrate adapted from Bon Appétit.